The Department of Labor and Employment (DOLE) at Manila Economic and Cultural Office (MECO) calls to qualified applicants in the domestic, manufacturing, and construction sector who are willing to work in Taiwan. 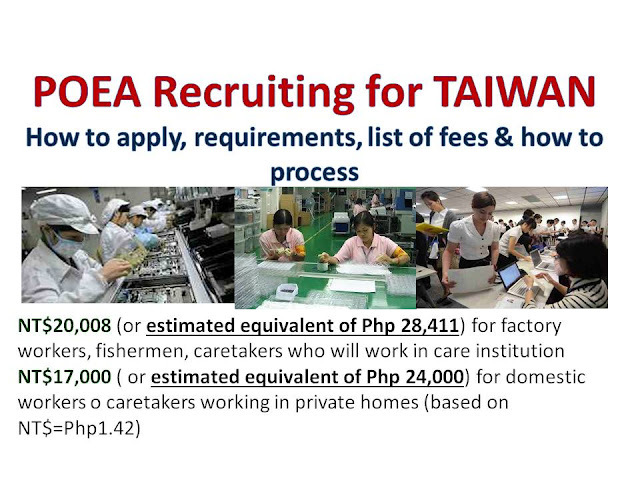 The recruitment process will be on a government-to-government through POEA and Direct Hiring Service Center - Workforce Development Agency of Taiwan, or much better known as Taiwan International Direct E-recruitment System (TIDES). In order to be selected, the applicant must have the following documents ready. 6. Must have enough experience in manufacturing, construction, fishery o domestic service at caregiving. How much is the expected salary? What are the salary deductions? 1. For the informal sector, deductions range from NT$20,820 to NT$22,373 for 3 years or NT$578 to NT$621 per month. 2. For the formal sector, deductions range from NT$33,780 to NT$285,780 for 3 years or NT$938 to NT$7,938 per month. There should be NO PROCESSING FEES OR PAYMENTS to be required from applicants during this phase. 2. Your digital photo will be taken in POEA. This photo will serve as your T-IDES application profile which will also be given to the prospective employer together with other applicants. 3. Taiwanese employer will choose and interview job applicants. 4. Chosen job applicants must respond to the job offer and requirements as soon as possible. 5. The job applicant will undergo medical examination in any DOH-accredited medical clinic, visa application, training/seminar, travel booking and OWWA Comprehensive Training Seminar (free).